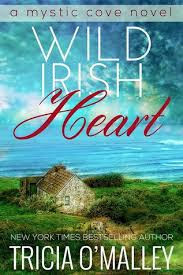 Wild Irish Heart was the first book that I have read by Tricia O' Malley and I have to say I enjoyed this sweet romance with a touch of magic. I loved the whole irish set up entwined with celtic magic as this is what gave the book an edge over normal contemporary romances. I am a sucker for alpha males that is why I enjoyed Flynn and his possessiveness, whereas at times I felt Keelin annoying as she was very confused. The secondary characters were well developed and I really enjoyed Fiona and her genuine relationship with her granddaughter. The writing style was okay, but I wished that this book had a dual point of view style as it would have given Flynn's character the depth that was needed. The chemistry between Flynn and Keelin was combustible and I loved it. I look forward to reading the rest of the Mystic Cove series. Keelin O' Brian always knew that there was something different about her and when she recieves an ancient book from her grandmother in Ireland, Keelin decides to finally investigate the Mystic Cove and it's hidden secrets. Once in Ireland Keelin meets Flynn, a surly Irish man who manages to always get on her nerves. Flynn has finally meets Keelin, who has been haunting his dreams for the past few months. Keelin and Flynn try to fight their attraction towards each other, but the magical cove has different plans for them. While Keelin is trying to discover her real self and her mysterious powers, she begins to fall for Flynn, but will Flynn be able to accept Keelin as her true self with her powers.